If you are the type of parent who loves the outdoor or who is always on the go and is looking for a cost-effective yet sturdy and comfortable travel system for their baby, then the Chicco Cortina Travel System will certainly meet your needs. This system comes with an adjustable handle, a one-hand fold feature and it weighs little over 20 pounds, which makes it a great device to have around. Besides, there are a few cup holders embedded in Chicco Cortina Keyfit 30, which are great both for parents and for the little one. On the other hand, the baby can enjoy a very comfortable ride thanks to the extra padding embedded in the system, as well as thanks to the extra efficient suspension system designed to give the baby the smoothest ride ever. This Chicco Cortina Travel System review will give you a deeper insight into the features, advantages and disadvantages of this travel system. Amongst the most important benefits of this travel system for babies, there are the multi position Memory Recline seat and the three position flat recline and leg rest, both of which are specifically designed for the comfort of the little one. All wheels of Chico Cortina Keyfit 30 have their own suspension system, and this little baby stroller also comes with fully reversible laminated canopy. Besides, given its durable and very sturdy construction, the Chico Cortina Keyfit 30 can accommodate infants that weigh up to 22 pounds, while the infant car seat has a maximum weight limit of 30 pounds. The travel system is packed with a series of safety and security features, such as the single strap installation system, the EPS foam lined shell, the dual bubble levelers or the built in lock offs designed for both the shoulder belts and for the lap belts. Chicco Cortina Keyfit 30 is also great from a practical standpoint, as it is very easy to fold and it actually takes very little space in the trunk of your car – its compact appearance makes it perfect for just about any trunk or cargo area, regardless of the size of your vehicle. 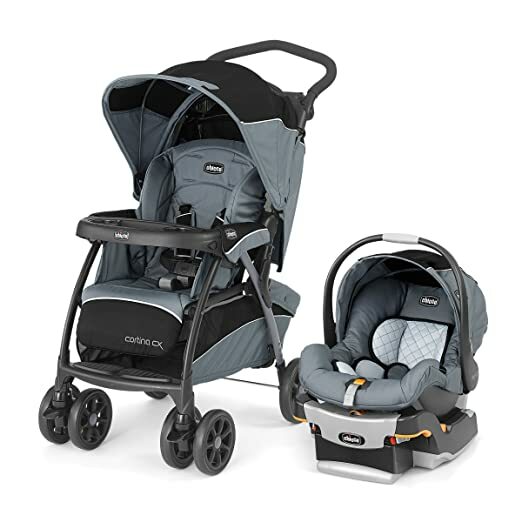 One of the downsides of Chicco Cortina Keyfit 30 is that, in spite of its very sturdy and durable construction (which is great), the travel system is slightly heavy, especially for moms. Weighing no less than 23 pounds, it can be difficult for a single parent to load and unload the travel system on a daily basis, especially if you have a lot of things to do out in the city. Other than that, parents do not seem to complain about anything in particular! If you are thinking whether to invest in Chicco Cortina Keyfit 30 or to keep looking, then the answer is yes, this particular travel system is certainly worth the money! It is not the most cost-effective option on the market, but it certainly does an irreproachable job, it has an outstanding maneuverability rating and it is very durable and compact at the same time.